For the last three years, Sarah McCarthy has served as the Connections Director at Aletheia Church, a church of 750 people across three locations in New England (she has been attending Aletheia for the last six years). Aletheia exists to make disciples who bring the truth, grace and changing power of the gospel, for the glory of God and the good of all people. Get in touch with Sarah via email. What does your training process look like for your Connection Team volunteers? Before the first Sunday that a new person serves, we have them complete an online training through a platform called TrainedUp. They watch a few videos that communicate the vision for serving in our church, the mission of our team, and some practical tips for engaging with newcomers in our church, and then they answer a few questions about why they are excited to serve. When they show up on their first Sunday, we have a leader who shows them the ropes of the practical setup logistics and coaches them through their first day. For ongoing training, we try to get our team together three or four times a year for a mix of fun events and trainings where we re-cast vision and build community on the team. How is your Connection Team structured? Do you ever release guest services volunteers to lead in other ministries? I support connections in all three of our locations (Cambridge, Boston and Providence), and I lead the Connection Team in our Cambridge location. In Cambridge, the core leadership of the team consists of myself, one leader who schedules the team, and another who trains new volunteers. On a Sunday morning, we have two shifts of volunteers (one for each of our services), and each shift has a team leader. When we host Newcomers Sundays, we also have a separate team of leaders and volunteers working on those events. Is guest services a “silo ministry” in your church? In other words, does your discipleship team, kids team, worship team, missions team, etc. view it as an essential part of *their* mission? I’d say that our teams all have a good awareness of the importance of connections, even if it isn’t their core role. A lot of that culture has been driven by our Pastors, who make it a priority to meet new people each Sunday before and after services and to encourage others to do the same. We talk regularly at leaders meetings about the importance of connecting with newcomers whether or not you are officially “serving”, and over time that mindset has grown in the church. The biggest threat to this is complacency – it’s so easy to get comfortable and only talk to people you know on Sundays! So we’re constantly having to revisit this and cast vision for why it is so important. What is a challenge you’re currently facing on your Connection Team? 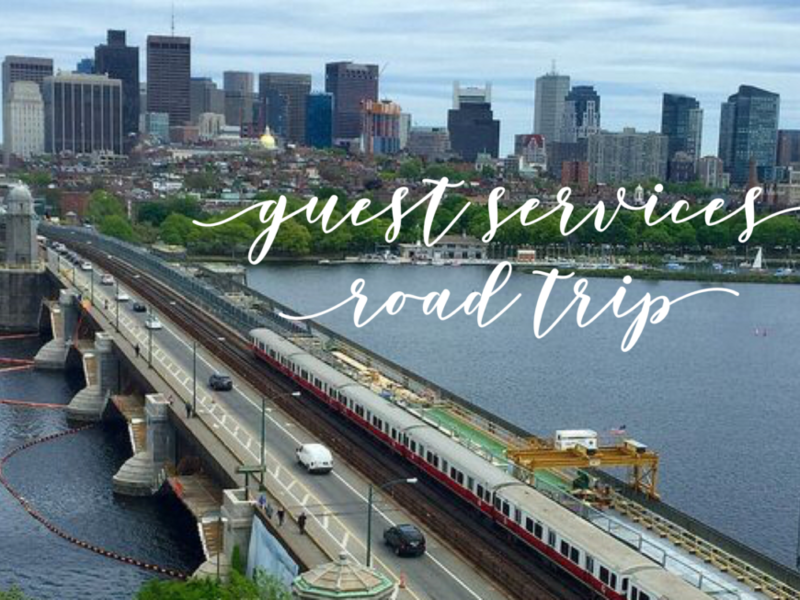 Cambridge and Boston are super transient cities – between 20-30% of our church moves away each spring, and in the fall they are all replaced by new people. It has always been a challenge to figure out how to build a culture of connections in a church where half of the people each Sunday still think of themselves as a “new” person. It means we have to be super intentional and move quickly! On our team in particular, we have a lot of volunteers who haven’t been at our church for very long, so they struggle to feel like they are able to help others connect. We’ve been building more this year into creating community on our team and supporting our volunteers, so that they are in turn better able to love our guests on Sundays, but it is a constant challenge to do this in a way that doesn’t overburden people with events but does help them feel loved and cared for.